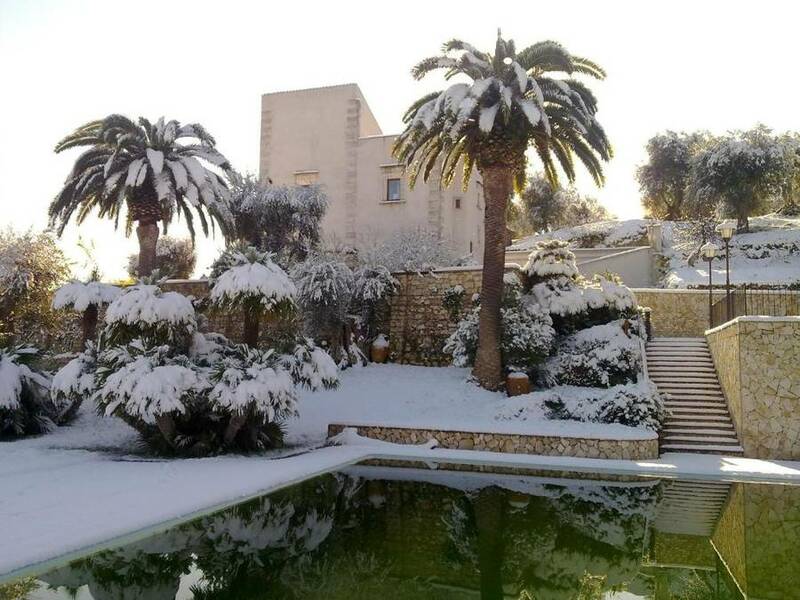 The historic olive groves of Puglia, the dramatic coastline of Gargano, the tradition flavors and hospitality of Italy: all you need for a perfect holiday is waiting for you at Agriturismo Torre dei Preti in Croci, just 3 km from the centre of the coastal town of Peschici and its beautiful waters. The 25 hectare estate that surrounds Agriturismo Torre dei Preti includes Italy's unique "Macchia Mediterranea" woods and fields, with Puglia's picturesque historic olive trees at the base of the historic 16th-century tower that stands at the center of the complex. The tower is furnished in an elegant, modern style and from its heights, guests can enjoy a spectacular view across the countryside to the sea. At Torre dei Preti, guests can relax in the lush outdoor oasis, with its large pool lined with tall palm trees and surrounded by lawns and a sundeck. No need to go far for a little R&R! Agriturismo Torre dei Preti offers standard and family rooms, the latter with covered outdoor verandas furnished for relaxing and dining. Both have a welcoming style and all the modern comforts you need to unwind in during your hollday in Puglia. The jewel in the crown at Torre dei Preti is its restaurant, which serves traditional dishes from the Gargano valley made with fresh local ingredients, including Puglia's famed extra-virgin olive oil from a nearby olive mill. Agriturismo Torre dei Preti is located in Croci just 3 km from the centre of Peschici and a 7 minute drive from the beach. The estate is 2 km from the Gargano National Park, 22 km from Vieste, 23 minutes by car to Rodi.